BME Temple University; studied with members of the Philadelphia Orchestra. Elementary school band director in South Brunswick Township, New Jersey. Free-lance musician, performing with the Central City Opera Orchestra, the Colorado Ballet, and other professional organizations. Over 40 years teaching experience; teaches all ages and levels. 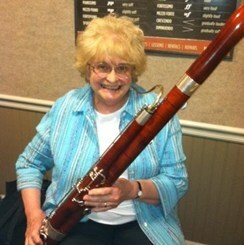 MNM, Regis University; executive director Lakewood Symphony Orchestra where she plays bassoon and contrabassoon. Request Lessons with Mary Anne today!